Following months of talk, preparation, and anticipation, the richest no prep race in history has finally dawned. Grudge, street, and no prep racers from around the country have descended on the San Antonio Raceway, deep in the heart of Texas, to take a shot at $50,000 to-win in the Big Tire class, and $10,000 in the equally-as-exciting Small Tire field. In addition to our SpeedVideo live coverage, we’ll also be bringing you lots of great photos and behind-the-scenes looks at this true outlaw-style event. A special thanks to our presenting sponsor, Fuel Air Spark Technology, for making it all possible! After heavy rain washed out last night’s planned rounds of qualifying, Bounty Hunters officials made the decision to go straight into eliminations this afternoon, which in in no prep/grudge-style racing, should make for some serious drama in the opening round. Many racers didn’t get down the track in their only test hit, and other arrived later in the day and will be taking their first crack at the track when it counts. We’ve seen a number of supercharged and nitrous Pro Modified cars roll in this weekend and even this morning, and so the first round (and every round) should be on hell of a show. Add in the fact there is no ladder — every round is either a call-out or a drawing for pairings, means that in any given round, even the first round, the two baddest dudes in the house could tangle. If you think there's any sticky left on this track, let us tell you, there isn't. Once you move beyond the starting line, where there's a hint of glue thanks to the racers' application of 'pimp juice', the rest of the surface is untouched and quite slick. Add in that the track officials are scraping the valuable rubber off the launch pad out to the 60-foot mark and there's even less traction there. This stuff is legit, folks. Shannon Morgan and Mike Murillo held the drivers meeting this afternoon, some expected cut-ups from the crowd and a handful of call-outs. A total of 45 Small Tire cars and 41 Big Tire cars are on hand. (Left) Big Tire hitters Kye Kelley and Shawn Wilhoit chat it up during the drivers meeting. (Right) Chris 'BoostedGT' Hamilton and James 'Doc' Love from Street Outlaws. As you might expect, given his stature on Street Outlaws: New Orleans, Kye Kelley is quite the attraction, with a steady flow of fans wanting a picture with the Mississippi racer. D3 Engineering out of Houston has brought out this nasty 2JZ-powered Nissan for some Small Tire action. The 187 cubic-inch mill is paired with a 94 mm turbo and two stages of nitrous (for about 400 horsepower), and on 70 pounds of boost, produces 1,600 rear wheel horsepower! Zach Park handles the driving chores for the car owned by Duy Bui. This is a legit street racing car in and around Houston, along with a little grudge and no prep action. We heard some numbers on how quick this car really is, but we're sworn to secrecy. Let's just say, we're more than impressed. A pair of heavy hitters, Kye Kelley and Larry Larson, drew one another in the very first round. Kerlley, who is running an engine out of Jason Thames’ Corvette, named “Justice”, put a couple of car lengths on Larson early and never looked back to move on to the second round. Shayne Ward in Air Force Won, one of the favorites in the Small Tire class, lost in a big upset in round one to the Quarter Mile Killer. Sergio Gonzalez, known as 'Flaco', was the only callout of the first round, matched up with Blake Jones and his 600-inch '55 Chevy for $1,000. The two raced off the trailer in the very first pair out. In what proved to be an exciting and controversial race, Jones put a couple of cars on Flaco on the top end, but got loose and hit the timing block and was disqualified, handing the win back to Flaco. This is how the pairings are draw each round, with poker chips sporting a number and a lane. The two drivers with the same chip number face off. A pair of Pro Nitrous cars squared off in the first round of Big Tire, with Tim Savell, arguably the quickest car on the property yesterday in testing, taking the win and moving on to round two. The 405’s own James ‘Doc’ Love of Street Outlaws fame hopped behind the wheel of Mark Winger’s nitrous-fed ’69 Camaro out of the Wingers Race Engines camp today to take on the Big Tire class. Love got WAY out of shape in the first round and nearly collected the wall, but got the win light anyway. He told us this was the first time he’d ever sat in this car and misjudged the kind of horsepower he had under him. The Granado Brothers ‘Blue Angel’ Mustang and Brian Rodrigruez in the Got Jaunchy rotary-powered ’72 Datsun brought the crowd to their feet with a staging duel that went on for more than a minute. Rodriguez finally went in, followed by the Blue Angel. Rodriguez was late off the line and never caught up. The San Antonio Raceway 1/8-mile is pretty tight, allowing racers to really put the horsepower down, but overstep its capabilities and you'll get in trouble in a hurry, as this Small Tire racer found. The Big Tire field has been narrowed down to only a handful, and it's a stacked handful....among them are James 'Doc' Love, Kye Kelley, and Birdman. Scott Taylor’s ‘John Doe’ Olds Cutlass, already down a cylinder after burning one up yesterday in testing, burned a piston in the second round and left a little fluid on the race track, ending his night early. In a huge upset, Kye Kelley and the Shocker went red in the fourth round of Big Tire, giving the win to Steve Wiley and his blown '63 Corvette Pro Modified car. James Love and James 'Birdman' Finney squared off in a battle of the heavyweights in the fourth round of Big Tire, and it delivered and then some for the massive crowd on hand. Birdman, the heavy favorite, got out by the wall and appeared destined for an early exit, but the Street Outlaws star got loose near the stripe and smacked the wall hard on the drivers side, in the process allowing Birdman to sneak back by for the win. Alex Almuger and “The Punisher” Chevy are moving on to the final round of the highly entertaining Truck class, where he’ll face Rey Espericueta. BoostedGT has been on a roll all night long, but his familiar Mustang spun the tires right at the hit in round five of Small Tire and is headed home. Shannon Morgan facilitates the drawing of poker chips for lanes and any money-split negotiations prior to the final rounds in the staging lanes. 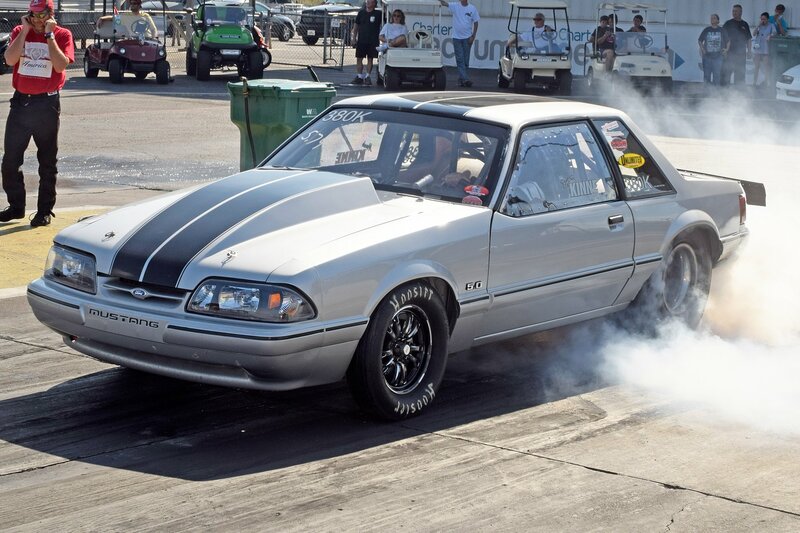 (Left) Duane Biddle and his 5.3L Chevy-powered, twin-turbo Mustang took True Street honors. Biddle came here with a brand new setup without any testing whatsoever and marched right through the field. (Right) Tony Thorn and his 'Terminator' Camaro beat all-comers for the $10,000 Small Tire prize, defeating Javier Carmona in the final. David Cook and his ‘Voodoo’ Chevy Lumina, with a BBC and a pair of 80 mm turbos, got the Big Tire Second Chance win in a close race with Pro Mod veteran Doug Reisterer. Ray Espericueta and his badass wheelstanding Chevy S-10 impressed all day long, using one last final wheels-up lap to claim the Truck class crown tonight. With the TOPMA Pro Mod race at the Texas Raceway cancelled this weekend, Steve Wiley made the trip to San Antonio to try his hand at no prep racing with a car many would have thought to be overpowered for the surface. But without so much as a test pass, Wiley showed everyone it could be done and motored through the 41-car Big Tire field and defeated Ricky Granado and his “Blue Angel” Mustang in an anticlimactic finale, as both tires stuck the tires and slowed, with Wiley making it further under power to coast to the win. Harlingen, Texas native Dylan Wells campaigns this striking Grabber Blue Fox body, with a 363-inch SBF under the hood, with an 80 mm BorWarner turbo in a blow-through carburetor setup on C85 fuel. Wells, a bracket racer, shared that this is a relatively new build for grudge and no prep racing. He’ll be gunning for the $10,000 Small Tire prize here this weekend. 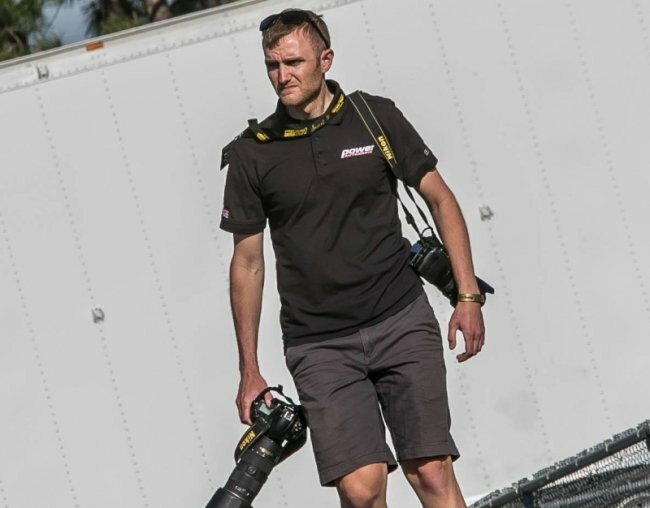 Fans of Drag Week will certainly recognize the absolutely show-stopping Nova of Coloradoan Matt Frost. Frost and his team drove over 1,000 miles here to San Antonio to take their very first crack at no prep-style racing. Frost has been 7.0's at over 200 mph with the all-steel machine, which sports power from a 632 cubic-inch big-block with twin 88 mm Precisions Pro Mod turbos. Rather than his lightweight Chevrolet S-10, Drag Week star and chassis builder Larry Larson has brought his iconic ’66 Chevy II down from Kansas to take on the Big Tire class. Larry told us this morning that he “brought a knife to a gunfight”, but you certainly can never count out the street legal legend. Kye Kelley, arguably the baddest man on big tires in the nation, proved why on his first test hit today, going straight and true all the way through the 1/8-mile while others were on and off the throttle and taking the adventurous route to the stripe. A foreign and perhaps crazy concept to most traditional drag racers, there truly are no dragging machines or track sprayers in sight at a no prep race. After drying the track today, officials scrap the excess rubber out to the 60-foot mark and sent cars down it without a touch of grooming. (Left) Matt Frost hit the tires HARD on a test hit this afternoon, eventually going up in smoke, with the wheels in the air, milliseconds after this photo was taken. (Right) Texas favorite James 'Birdman' Finney took a couple of cracks at the race track, struggling a bit on the first run but legging it on through on the second. Finney, with a recent war of words to settle with Kye Kelley, might be eyeing an early matchup with the Street Outlaws star. Brent Austin trekked to San Antonio 22 hours all the way from Virginia for a crack at the fifty large this weekend with his badass '69 Camaro, known as 'Megalodon'. The car sports a 565-inch big-block Chevrolet fed by an F3-136 ProCharger and Brodix Head Hunter cylinder heads. Austin utilized a Wilson Manifols elbow, throttle body, and intake for the build, along with Billet Atomizer 800 lb injectors. Austin bought the car a number of years ago as a backhalf-style Outlaw 10.5 car and re-did it from front to rear, adding a Fab9 housing, spindle mount front suspension, and other top-notch parts. Chris “BoostedGT”Hamilton of Street Outlaws fame is a favorite in the Small Tire class. Hamilton arrived this afternoon and made a test ‘n tune pass, going wheels-up out of the gate and straight on through until around 500 feet, when he got completely sideways headed toward the centerline. So, how do they make these cars get off the starting line as well as they do, in the absence of proper track prep? Well, an age-old street racing secret, racers use what's known as 'pimp juice', or typically a mix of traction compound (like VHT) and xylene (to help water it down a little) spread under the rear tires. They'll tell you it's hand soap in that bottle, but you don't want to wash your hands with it. After doing the burnout, a nice coating of pimp juice is covers the tire tread, giving racers just a little assistance planting the power on the starting line. As you can see, a line of demarcation is made on the track surface to notate the furthest point forward that teams can apply their pimp juice. Bay St. Louis, Mississippi's Bruce Darby drives this '63 Corvette, owned by Joe Jenkins and tuned by Freddie Sandrock, in the Big Tire class. Bracket racers themselves, they decided to bring their potent 'Vette, named 'The Alcoholic' for some Big Tire action. The car sports a 622-inch Reher Morrison powerplant with a single stage of nitrous oxide. The car has been 4.80's on motor. Darby tells us a new powerplant is on the way and should have these guys square in the mix in the coming months. While this four-wheel drive, diesel pickup truck is quick all on its own, the no-prep surface really brings lighter, more aerodynamics machines back to it in the performance department. On one run, it was only a few strides behind one of the quicker Small Tire cars in the other lane. If we had to guess, this truck is pulling off some mid to high 5-second 1/8-mile runs. Shannon Morgan, one of the most respected promoters and consultants in the no prep game, held the drivers meeting this afternoon prior to the opening of test and tune. With Mike Murillo and a flock of videographers watching on, Scott Taylor motored his Cutlass to a pretty stellar run, raising the eyebrows of everyone on the starting line after the boost came in.